Have you ever visited New Hampshire during the Autumn season? If not, you are really missing out! New Hampshire has some of the best Fall Foliage here in the Northeast. Several years ago hubby and I took a road trip through New Hampshire and it was absolutely gorgeous! Here is some information on the Fall events currently scheduled for the Waterville Valley area. Fall is definitely one of the best times of the year to plan a visit! Autumn is here, and it is a special time in Waterville Valley in New Hampshire. The surrounding White Mountain National Forest serves as the perfect scenic backdrop for family friendly fun, a couples getaway or a group trip. 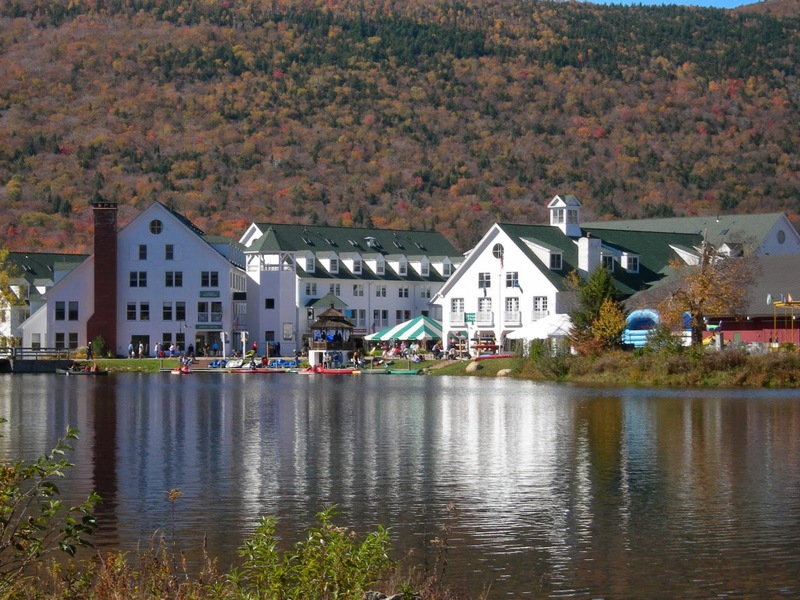 Staying at Waterville Valley Resort gets you closer to fall scenery with a variety of options and activities, whether you are an adventurous outdoor enthusiast or looking for a more low-key, relaxing experience. There is something special about being in the valley surrounded by the mountains, away from the traffic and noise of a large city. Waterville Valley Resorts Freedom Pass gives visitors access to a wealth of activities, from tennis and golf to ice skating, boating and trolley rides around the valley. There are many options whether youre looking to be active or spend some time relaxing. You don't have to be a professional to enjoy the Golf Clubs nine hole course or tennis on one of the Tennis Centers 18 courts. Or, head over to the Waterville Ice Arena for some ice skating. For a slower paced but scenic activity, take a paddle boat ride around Corcorans Pond or a ride up the Snows Mountain chairlift. No car necessary! Waterville Valleys open air trolley stops at many locations around the valley and can bring you wherever you need to go, or on a nice unhurried tour, Visit Town Square, where theres a variety of restaurants, shops and nice view of Corcorans Pond. This is also where many events take place and visitors gather just to take in the scenery. Hiking is one of the most popular fall activities in Waterville Valley, dating back to the 1800s when the Waterville Athletic and Improvement Association was formed. The association still exists and oversees 100 miles of trails around the valley, ranging from easy, flat walking paths to more challenging climbs. Access the trail network around Snows Mountain by foot or via the chairlift. Maps are available, noting beginner through advanced terrain. Welch Mountain & Dickey Mountain Loop: This hike loops across the summits of the Welch and Dickey mountains, both nearly 3,000 feet in elevation, providing nice views along the way. Mount Osceola: Mount Osceola is one of 48 mountains in New Hampshire known on the 4,000 footers list produced by the Appalachian Mountain Club (AMC). It is accessible via Tripoli Road in Livermore or off the Kancamangus Highway in Lincoln. Another way to hit the trails in Waterville Valley is on two wheels. Bring your own bike or rent one from the Adventure Center in Town Square. This is a great activity for beginners and experienced riders alike. With more than 30 miles of trails, there is a variety of terrains for all abilities. You can even take the bike up the Snows Mountain Chairlift and choose your path down. The trails are well-marked with checkpoints and maps along the way. In addition to well-maintained rentals, the Adventure Center offers guided lessons with instructors to make sure riders feel comfortable and suggest suitable routes. This is a unique way to take in the beauty of the surrounding White Mountain National Forest. This is an annual favorite in Waterville Valley. Area restaurants compete in Town Square for the title of best chili. For $7.50/adults and $5/child (12 & under) attendees can sample all of the contestants chili and vote for their favorite beginning at noon. Uncle Steve Band will play a free live concert from noon to 3 p.m. There will also be hot sauce samples from New Hampshire-based Jehu Hot Sauce and a brew tent open until 4 p.m..
Back for its fourth year, this festival provides stories for people of all ages, including childrens stories, ghost stories and more. The event runs Saturday through Sunday morning, featuring nationally known storyteller Odds Bodkin. Nearly 15 experienced storytellers will entertain audiences in various venues, separated by age groups/genres. Celebrate fall in the Valley with the Fall Foliage Festival, held during Columbus Day weekend. A weekend of fun events is planned, including childrens games, pumpkin painting, and live music. On Sunday, there will also be a 5K run/walk hosted by the Waterville Recreation Department, a beer garden with fall brew samples, a corn hole tournament, and a stein holding competition. Guests of all ages are invited to enjoy this festival.